• Was it too windy on the beach for a game of Catan? Was the table too small to set up the island? Were you unable to settle Catan because there were only two of you? Or did you always have to leave Catan at home because there was no room left for it in your suitcase? "Catan - Traveler" would have prevented all this from happening. 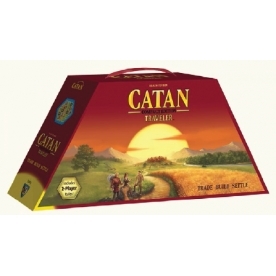 • "Catan - Traveler" is based on the same rules as "Catan - The Game," its "big brother." At the beginning of the game, you and your opponents each build 2 settlements on the island of Catan. If the numbers of the terrain hexes your settlements are adjacent to are rolled, you receive resources. You use these resources - ore, brick, grain, lumber, and wool - to build roads in order to reach new settlement sites, to upgrade your settlements to cities, or to buy development cards so you can, at the right moment, turn the tide in your favor. If you lack a particular resource type, you trade with your opponents. If you trade cleverly and have a little bit of luck, you have a good chance to win the game. • Skills: Clever trading, strategy, tactical skill, luck.